HOW DO YOU PICK UP A RABBIT? Rabbit personalities (like people) vary, some bunnies enjoy handling more than others. Some are carriers some are lap sitters and some are cuddlers. Whatever their natural inclination, they need to feel safe. Ask for a demonstration when you buy your bunny and then practice a lot. The more you handle it the easier it will become for both you and the bunny! The photos (to follow) show different ways to pick up and carry but their is no substitute for practice. 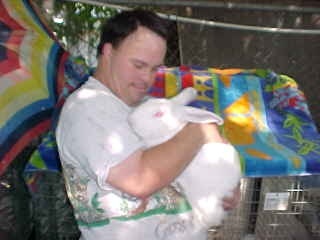 Some rabbits are easier to pick up by the loose skin over the middle of it's back and others prefer a hand under the belly gently lifting up. Many show breeders never pick their rabbits up by the scruff fearing injury to the animal or crushing of the pelt but for a new handler, there is less likelihood of dropping a disorderly rabbit. But only pick them up in the MIDDLE of the back balancing the weight on both sides of your hand so they don't kick and injure themselves. Then quickly bring the rabbit to your body, supporting the buttocks. It should be a fairly swift movement and not intended to carry them like a sack of groceries. Don't be timid! Hold on firmly. He'll feel safer. Bear in mind that a rabbit was born to have all four feet on the ground. When you pick him up and his feet aren't touching something, they feel insecure. Keep all four feet resting on your chest, lap or forearm and cover his ears with your free hand. If their ears wobble, they loose their equilibrium. When ears are covered, they feel more secure and you have more control. One hand under the buttocks and one on the ears is easiest. The head nestled under your arm with your hand holding the buttocks is another safe feeling for the bunny. The important thing is to start handling the bunny early so he trusts that you won't drop him. Have children start out sitting down and picking the bunny up from the floor. Walking around with the bunny is asking for trouble. The child might fall, the bunny might scramble from an insecure grip and can fall to the ground causing serious injury to both the child and rabbit. Wrapping the bunny in a towel or baby blanket at first also increases the feeling of safety for both rabbit and human. In short order, the bunny will feel safe and won't care how it gets picked up if it trusts you or your child. NEVER, EVER, PICK A RABBIT UP BY THE EARS!!!! HOW DO YOU KEEP FROM GETTING SCRATCHED? The most likely times to get scratched are in the process of putting the bunny in the cage and taking it out. A simple technique learned from the start will make everyone's life easier. When you take a bunny out or put it in the cage, do it backwards. The instinct is to jump towards the floor when put in the cage forward, hence the arms get scratched as the bunny pushes off out of your hands. If he goes in backwards, he doesn't see the floor coming up to greet him and in he goes quietly. Likewise, taking the bunny out forward, the feet go out to the sides catching in the cage wire and making it uncomfortable for both you and Thumper. Turned around backwards there are no parts to hang up on the door or cage wire. A large door opening makes handling easier. It may feel a little awkward at first but is easy enough to learn and well worth the effort. Check back when I get the photos up. It makes better sense when you can see it.